the M-Wave trailer was delivered in a large cardboard box and with a normal package service, up to the front door. The box of the trailer was itself a safety flag, the tires, the drawbar, a trailer hitch, rain cover / the reference and the operating instructions or assembly instructions. Tool was not included, more in the paragraph for installation. When unpacking from the box we find the first differences with models from other manufacturers. 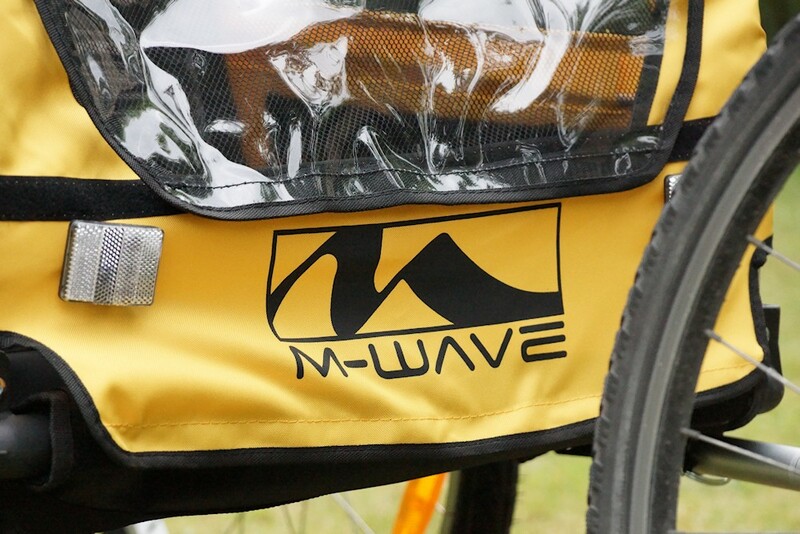 When M-Wave Bicycle trailer, the side parts are fixed and collapsed. In the side parts is still a stabilizer bar. Here, one on each side and fixed the erected side walls with an aluminum rod. This transverse rod is at the same time the support for the back or for the seat cloth. This rod is already attached to the left of the side panel. On the other hand it is conducted in a plastic holder and secured with a safety pin. This spinning is again protected by a spring. Slipping out of the splint is not possible. The M-Wave Pendant is now set up and forward, and open at the top. The actual cover 600D polyester fabric must pull itself over the frame. Before we do this, we assemble only the impellers. Anyone who wants to push the hub here will soon notice that does not work. To fix the 20 inch aluminum wheels, you have to put it into the axle and push in a spring. The spring releases the lock and closes it again. The wheel is now mounted. The note in the manual: Be careful that the wheels are securely attached to 100%. The drawbar is ready mounted with a screw on the trailer and folded under the trailer. Thus, the handle can be placed in the correct position, the safety pin must be released and pulled.The drawbar can now be folded forward, to the extent that the hole for the split pin is now on the exact opposite side. Now the splint can be re-inserted and locked on the other side. The tiller is now fully assembled. Tool you do not need this. Finally we pull the hood over the trailer and connect it so. The fabric cover is in front, behind and attached to the sides by means of Velcro on the side parts. The Velcro closures keep well and sit well above the other. 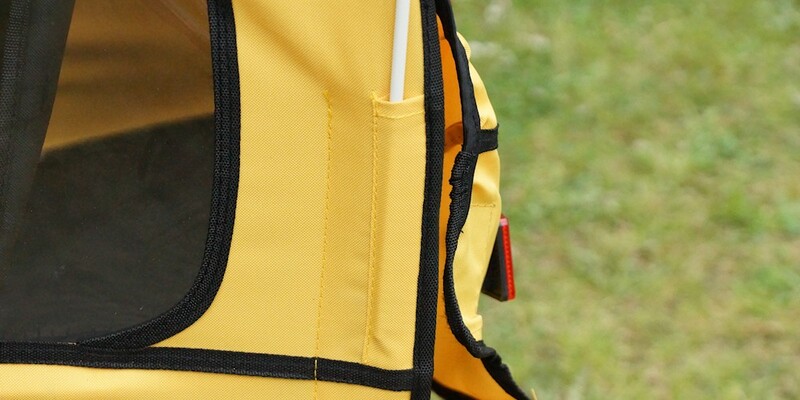 The coating makes the child carrier completely and can look like a him. At the rear of the hood will be attached with a zipper at the bottom. The safety flag is inserted at the rear left side, in a designated fabric bag. Even the M-Wave Bicycle trailer is assembled and we are dedicated to the trailer coupling. This child carrier only a trailer hitch was, unlike as in some other manufacturers, only a tractor with the standard delivery can be rebuilt. For this purpose we solve the wheel nut on the left side of the rear axle. We put the tow bar on the rear axle and turn the nut on it again.Now tighten with the wrench and the clutch is mounted. The trailer can now be hitched. For this we push the tongue on the tow bar and insert the safety pin through the hole and fix it with the spring. Following yet the safety line, attach the tether and the chain is on the bicycle. This pendant comes a, in comparison with other models and manufacturers, a lot simpler before. Thinner pipes, fewer accessories and very simple. Connections between different materials and bolted into place. Rivets We have no where we present M-Wave trailers found. Why do we emphasize this, later in the conclusion. The welds look ok, it was trying to work clean. Usually this point is what we call brakes and safety without brakes but we can use it not just call it that. The present model we have no brakes. The M-Wave pendant has 2 red reflectors on the rear and two white men at the front. Similar to a different model of our tests, but these are folded up with the guard. We find this is not good. At the rear, there is still a small triangle that reflects from light. On the sides otherwise no light strips or reflective tape attached to the fabric. The manual is advised not to drive in the dark as possible. In the 20-inch wheels are «cats eyes» installed. 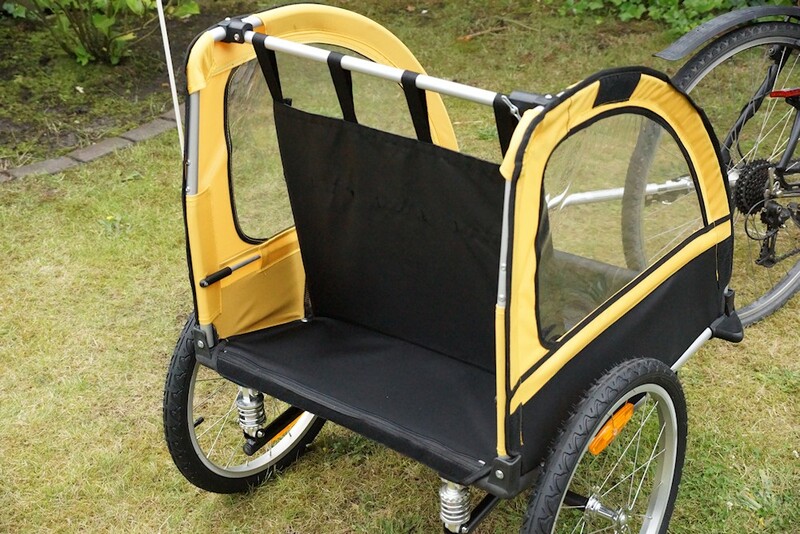 For more information about visibility of bicycle trailers and how to make his trailer for the darkness fit, you read in the bicycle trailer test . The insect screen is quite coarse in comparison with other manufacturers. Flies, wasps and bees have no chance, very small insects could after landing but try to crawl through the mesh. An ant would have felt to come no problems through the mesh. 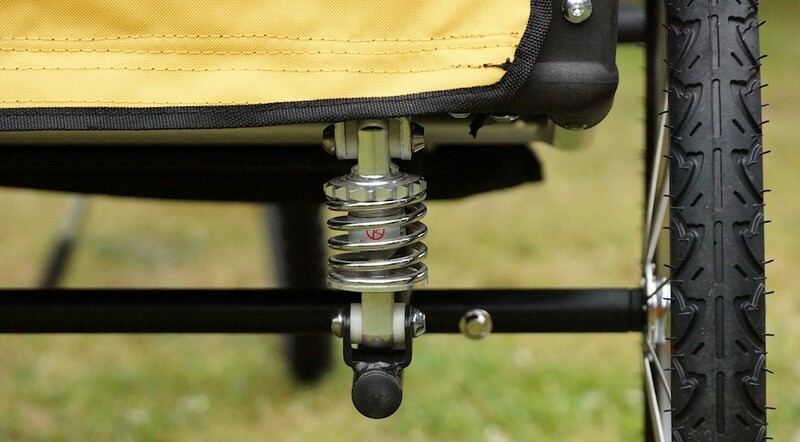 The suspension on the trailer is present and can be set by adjusting the spring plate. The suspension is mounted to the rear of the trailer and absorbs bumps and unevenness of the track. Why the dampers but each way around mounted, remains a mystery. 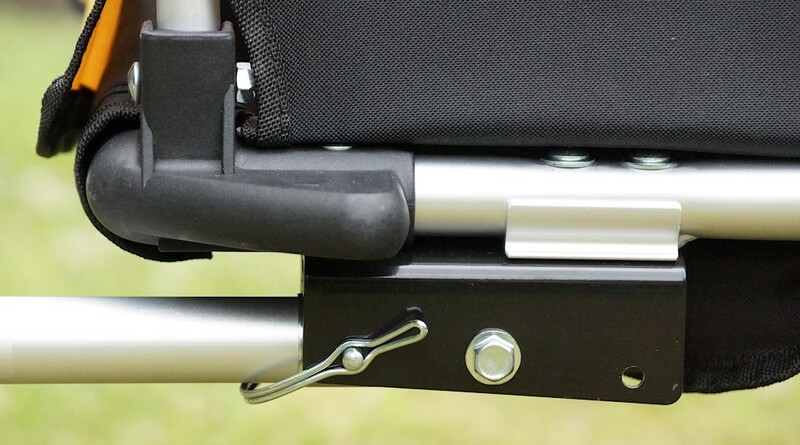 course The M Wave bike trailer also has a tether or a lanyard to the drawbar. This ensures that the trailer connects to the towing bicycle reserves when the clutch failed once. The pennant is decorated in yellow M Wave, which is a pity. In a bold orange or red, he would be much more noticeable to detect other road users. Usually set during M-Wave to a cloth seat. As already mentioned, during assembly, it is attached to the rear transverse strut. One possibility for adjustment of the backrest does not exist. The trailer carries accommodate up to two children, according to the manual. The double Anschnallmöglichkeit suggest this. However, the 5-point harness can also be used for a child. Safety on the backrest remember coming back to the rules to be observed during.Again, please only with a bicycle helmet aboard. Behind the seat back is sufficient storage space for blankets, shopping and other things.Here, however, is already 2 kg reached the end at the maximum load in the storage compartment. More than 2 liters of milk go in here, even if the space suggests a lot more. In the passenger compartment to the left and right is each a bag. For this M-Wave model there seems to be no extensions. The trailer one notices behind the bike, similar to his colleagues, this is not strange at about 13 kg. The actually sit on a child is not a problem and very easy thanks to the large opening.The trailer runs rational behind the bicycle. Again, who has no experience with driving a child trailer, should from time to look back just at the beginning. The suspension absorbs bumps and are only weakened to the interior further. The M-Wave Bicycle trailer is approximately 226 Euro (Price of catalog of the manufacturer) of the cheapest in its class in our test. If one believes the saying «quality has its price,» so he can be quite also apply. The trailer may be an entry-level model for a small budget, you get offered the budget accordingly. Let’s start with the things that we liked. The pendant has a suspension, which we found great. The fast assembly (about 15 minutes) we also liked very well. In principle, no tools are required, except for the towbar. Generally however, one should check all the screws again to strength. We looked at the current catalog (PDF) and the manufacturer could not find a model that our delivery corresponded. Indicated with 60 kg of maximum load in the current catalog, our trailer has more than 40 kg according to the manual. The model «M-Wave CARRY ALL 40» (item number 640092) is our model very close, we suspect that this is the correct model. We find neither the catalog nor the Internet a model that looks like what we have received (eg with black plastic corners in front). After Manufacturer it should involve to the «Kids Ride Comfort». According to the catalog ( 2013 version ) is the trailer TÜV tested. A seal or a note in the manual, we have not found. The manual is very economical with clues and contains partially pixelated images. It’s all a bit confusing. The processing and construction have made a rather simple impression. The protective wedges for the wheels are in our opinion too far forward. These include directly next to the wheel. Even if the wedge can slip past an obstacle the trailer, the obstacle may still stick to the tire anyway. However, as a display for the Maximum width are suitable. Spoiled by other manufacturers, we found it a pity that only one clutch is provided. A trailer without brakes lose important points in terms of safety, as well as secure parking is important. The insect screen could be a bit tighter. Let. To the 13 km / h as maximum recommended speed, which is very slow for a bicycle For our taste too slow. 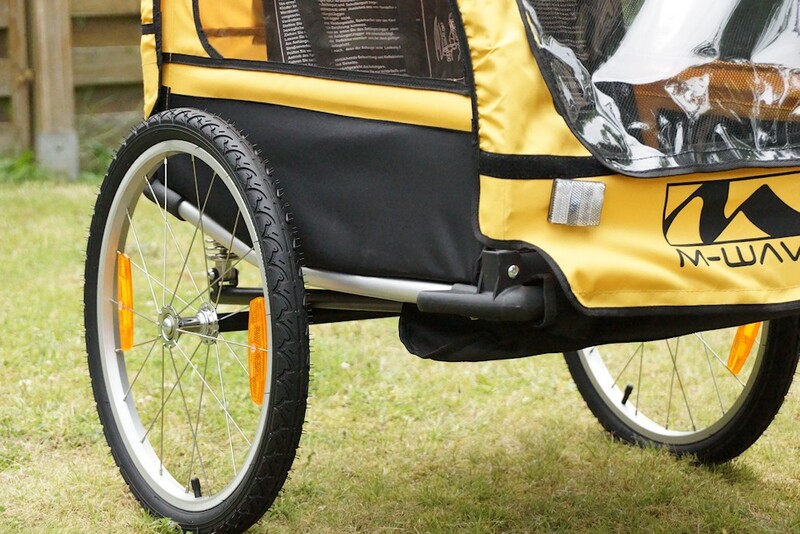 Considering the price-performance ratio of the M-Wave Bicycle trailer gets the test of us a rating of 3 out of 5 points. He is the best trailer and safe for a smaller purse an alternative, here you but also gets less than his colleagues offered. Note for Test Procedure: For our test we have for security waived with a child to ride. The testing of borderline situations curbs, traffic lights and narrow streets would have been too risky. Instead, we have placed a weight of 20 kg in the trailer and secured with safety belts. 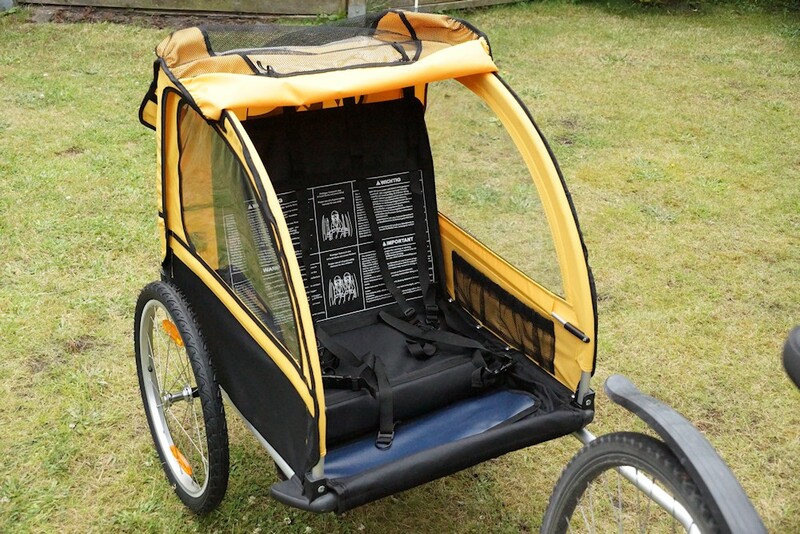 Bike magazine has not tested the child carrier on security or pollutants. The focus of the test is to use in everyday life. To point deduction above instructions have led. The seat we have tested in the state with a child. It should be read in any case the user before use.